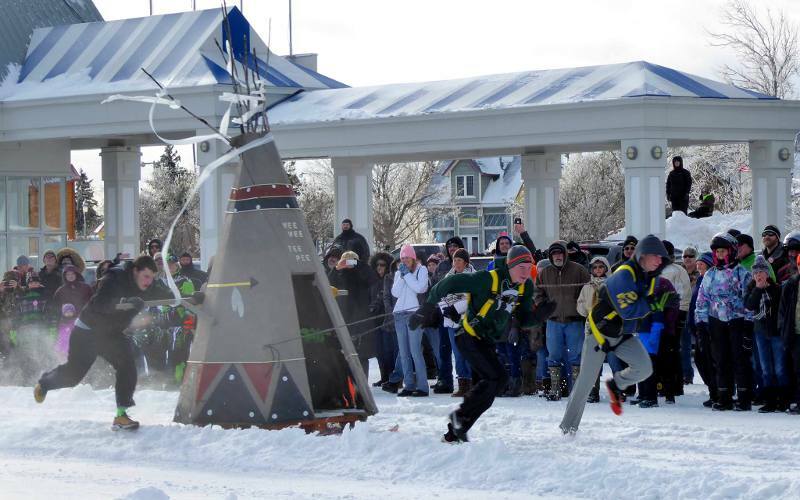 The 2019 Mackinaw Pepsi International Outhouse Races in Mackinaw City, Michigan will be held Saturday, January 19 at 2PM at the Shepler's Lot located at the intersection of Huron Avenue and Central Avenue. It will begin with a parade of outhouses. The races are open to both Adult and Junior Teams and each team must have 5 people, with one riding and 4 pushing and pulling. The Outhouse must also have a Toilet Seat and have Material to Wipe with. There is a $500 grand prize and other awards. 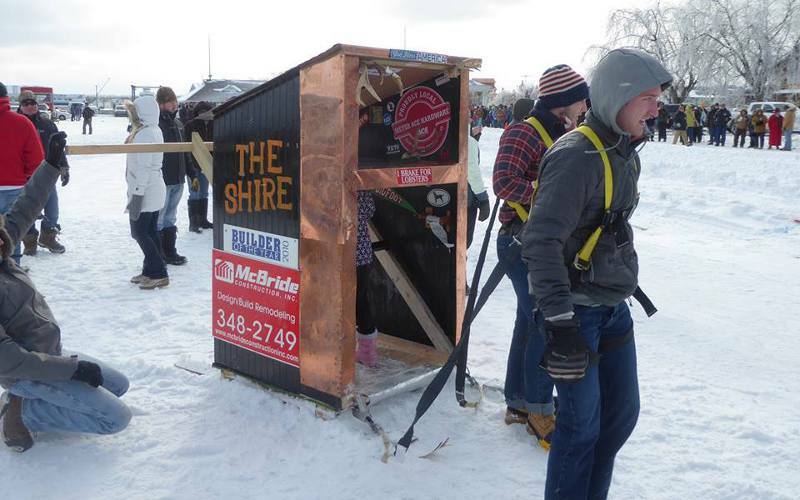 Most of the photos on this page are from 16th annual Winterfest in 2009 when there were 11 outhouses entered, though some outhouses were used by more than one team, so there were at least 14 teams competing. It was a gloomy, cold windy day with a wind chill below zero. There was a warming area slightly out of the wind, but the snow had melted in that area and people wanting to warm up had to stand in water. Your entry in the International Outhouse Races is welcome. For more information call 231-436-5493. The photos from 2016 are courtesy of Todd Hargraves. The 2016 winning entry from the Tee Pee Campground has been entered in the races for several years. This outhouse was only on exhibition and did not race. 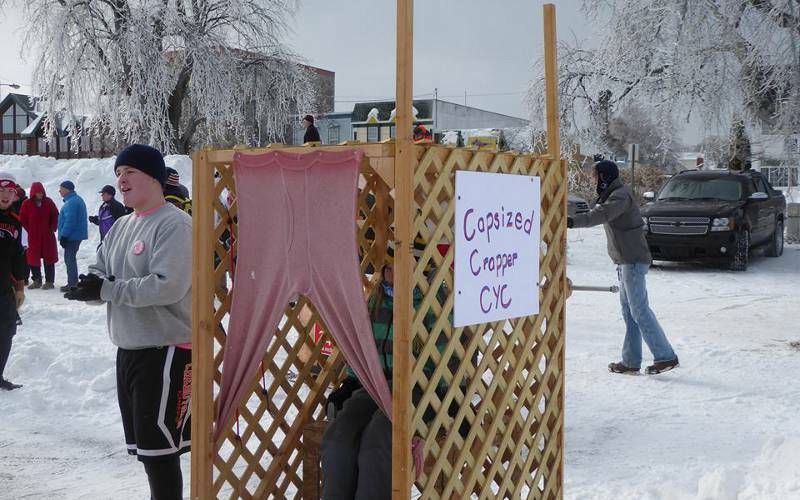 3rd place outhouse - "Holy Crapper" by Mackinaw City's Key Hole Bar. Flamingo Flushers have competed for several years. 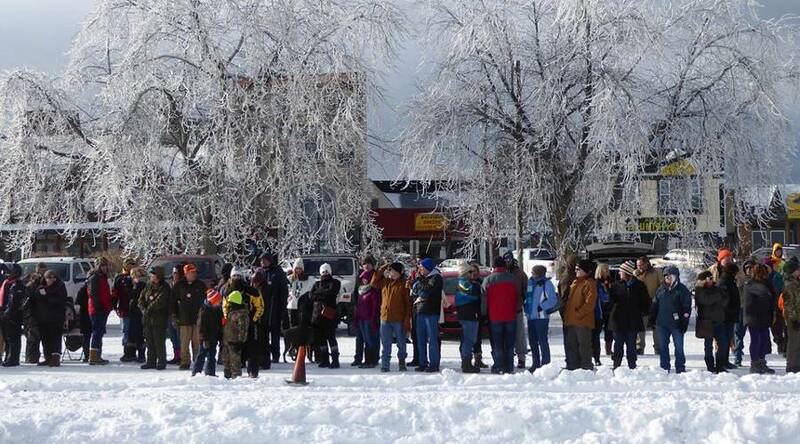 by Cheboygan Dental Group and Hoppie's Bar, also won Best of Show. Copyright 2009-2019 by Keith Stokes. 2016 photos copyright Todd Hargraves. These photos may not be reproduced without written permission. .